Those who require paramount safety in regards to restructuring powdered items need to buy bacteriostatic water – it’s a mandatory component of the administrative procedure relating to secretagogue utilisation where the aversion of stressful/harmful physical issues is concerned. Bacteriostatic water for injection is highly sterilised and perfectly balanced to ensure that harmful bacteria are unable to develop within the vial – this is a step above simply using “clean” water; it’s a bona fide guarantee that you’ll have zero complications. Buying bacteriostatic water is easy at Valkyrie; we only offer items produced in accordance with stringent quality control standards. This is one of the reasons why we are a trusted supplier for the medical industry; safety is paramount at all times. It’s for these reasons and more that we have become one of the leading figures on the Internet in our field; purchase anabolic steroids and the necessary supplementary components to go with them from us and you’ll never look back. Trust is crucial – our strict code of operational ethics means that after your first cycle with us, you’ll simply never look back. There’s no need to risk your money anywhere else. How To Use HGH With Bacteriostatic Water? The reason why vials of bacteriostatic water are required to implement HGH peptide varieties is because they arrive in powdered form. You must “melt” this powder in specialised water prior to it entering the body; initially, this “restructuring” of the item takes a little getting used to, but once you have done it one or two times it becomes relatively easy to perform. Your vials of bacteriostatic water must be combined with said powder at a precise level; thus ensuring that oversaturation doesn’t take place leading to destabilization. As a general rule of thumb, you must combine 0.5 ml of water with every 1 mg of powder to acquire the right consistency needed for implementation. This is going to be vital to ensure optimal peptide delivery and safety. For instance, 2mg of product would require 1ml of water, whereas 5 mg of product would require 2.5ml of water. If you carry out the procedure as outlined here, then you’ll doubtless have a positive time utilising this item. 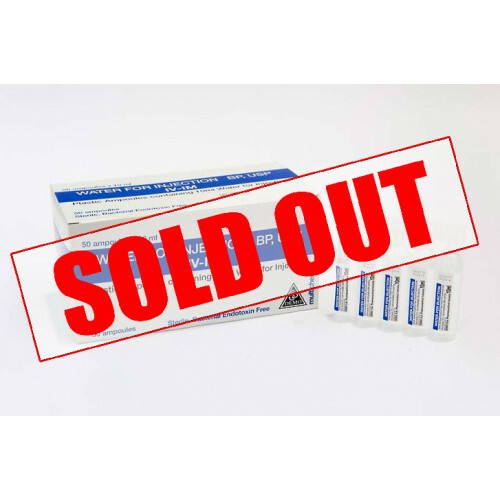 It’s easy to buy bacteriostatic water for injection from us by using the Valkyrie store – we have a wide selection of supplementary items including sterile pads and empty syringes in order to facilitate every necessity of your integration phase. To buy injectable steroids online, including the aforementioned items, simply look by name for the item you desire with the search function, and you’ll see a wide array of different listings within that category. Once a product has been selected (in this case BS water) simply add it to your cart and proceed to fulfil the needs of the on-screen instructions provided – this is the easiest way to order bacteriostatic water and the best in terms of ensuring safety. You no longer have to risk your health and money shopping for bacteriostatic water with back street suppliers or illegitimate web retailers; allow us to guide you towards maximum results and optimal vitality with all of your subsequent cycles from now on. You’ll never look back.